Making model cars is a hobby for many, but if you’re strapped for cash it can be very expensive to buy expensive all-inclusive model-car kits. If you’re in the mood to build something with your hands, use an old aluminum pop can and some wooden car wheels to create your own working car. Simple parts like wheels and axles can be purchased at a hobby supply store. Use your imagination to decorate the finished product so it looks less like an aluminum can and more like a proper vehicle. Set your aluminum can on a flat work surface and use a permanent marker to mark out the exact location you want your wheels to sit. Use a ruler to help you align the marks on either side so your axles are straight. Use a drill with the same size bit as your wooden axle to drill the holes. Drill two holes on either side of the can for a total of four holes. Thread your one wheel on to each wooden axle and push the wheel down so it is held against the hubcap at the end of the axle. Then, insert the axles through the holes, thread on the other two wheels and then attach two hubcaps to keep the other wheels in place. 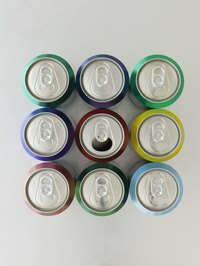 Use paints, stickers and other craft supplies to decorate the outside of your aluminum can and make it look more like a toy car.